Place the cream, milk and vanilla pod in a pan and bring almost to boiling point. Remove the vanilla pod, split it and scrape the seeds and sticky interior into the hot milk and cream. In a bowl, whisk the eggs, egg yolks and sugar together, then pour over the hot milk and cream, continuing to whisk as you do so. Return to the pan, over a very gentle heat, and stir almost constantly with a wooden spoon, until the custard thickens enough to coat the back of the spoon. Stir in the calvados, and remove the custard from the heat. 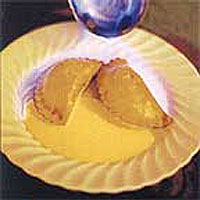 The custard can be allowed to cool, then gently reheated before serving. Liven up with a small extra dash of calvados just before serving. For a dramatic, seasonal send-off, put a hot mince pie with a generous slosh of the hot custard on a warm plate. Warm half a tablespoon of calvados over a candle, then set light to it and pour the flaming spirit over the plate. Serve at once.